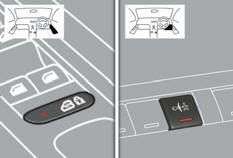 Remote control system to prevent opening of the rear doors using their interior controls and use of the rear electric windows. With the ignition on, press this button. The indicator lamp in the button comes on, accompanied by a message to confirm that the child lock is on.